We are writing to you with grave concern for thousands of residents in Masvingo Province who are facing the threat of imminent eviction from their residences and lands, and scores of people in Bindura district in Mashonaland Central Province who have recently been evicted from their homes. We are also deeply troubled by the reported treatment of a community in Mutare district of Manicaland Province who are currently seeking redress for evictions they have been subjected to. On 8 January 2019, 1,000 families from Mzaro Farm in Masvingo West were served eviction orders signed by the Ministry of Lands, Agriculture, Water, Climate and Rural Resettlement. The orders cited violation of section 3 of the Gazetted Lands (Consequential Provisions) Act Chapter 20:28, claiming that residents are occupying land without lawful authority. Masvingo Provincial Affairs Minister Cde Ezra Chadzamira has been cited as stating that the primary targets for eviction are those who settled illegally around major dams. However, some residents have lived at Mzaro Farm since prior to the construction of the Mutirikwi Dam as part of a land concession allowing them to settle there, while others occupied the land during the land reform in 2000. Community members have built permanent structures on the land, and some insist they have regularized their residency with the Ministry and pay taxes. The government has not offered compensation or alternative location for resettlement. In Chiredzi District, the Ministry of Lands, along with the local District Administrator, plan to resettle over 10,000 people in Feversham, Arda Magudu, Mutirikwi Section, Wasara Wasara, Chegwite, and properties in the Save Valley Conservancy (Lavanga, Masapasi, Angus and Mukazi), also citing Section 3 of the Gazetted Lands Act Chapter 20:28. Minister Chadzamira has confirmed that more than 2000 families are facing eviction. In Mwenzei District, Zimbabwe Bio Energy (ZBE) is threatening to evict 2,713 households from lands on Naunetsi Ranch that they received as compensation in 2014 after their relocation due to construction of the Tokwe-Mukosi Dam in Masvingo. Currently the company is fencing all its property, including lands used by residents for grazing, and is preventing residents from using dip tanks and accessing other water sources. The community now relies on 35 boreholes that pump only saline (non-potable) water. Recent evictions have occurred also in Bindura district in Mashonaland Central Province, where scores of farmers have been removed from their residencies on Claverhill North farm and have been living in a makeshift squatter tent for three months. In yet another recent case, members of a community of 1,000 families who were evicted from Marange diamond field in Manicaland Province and relocated to Ardu Transau in Odzi beginning in 2010 have experienced threats of attack by unidentified persons. The community is currently taking the government to court over their eviction and entitlements and believes this intimidation to be related to the case. We are convinced that an urgent solution is required to prevent the violation of the human rights of these communities. According to international human rights law, the Government of Zimbabwe has the obligation to respect, protect, and fulfil the human rights of its citizens. Evictions and demolitions, with their grave human and material consequences, may violate the human rights to adequate housing, property, decent work, adequate food, family life, equal protection under the law, personal security, fair trial, decent work, education and health, as well as the Zimbabwean’s constitutional right not to be deprived arbitrarily of the right to use and occupy agricultural land, among others. Having ratified the International Covenant on Economic, Social and Cultural Rights (ICESCR) on 13 August 1991, the Republic of Zimbabwe is treaty bound to conduct itself according to Human Rights Standards. Thus, by conducting and threatening these evictions, Zimbabwe may be violating articles 6, 7, 10, 11, 12 and 13 of the Covenant, including the duties specified in the General Comments Nos. 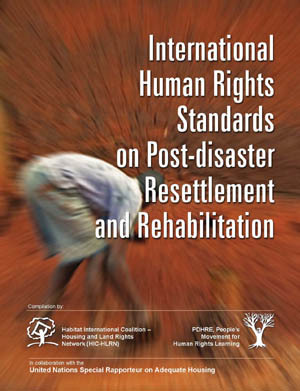 4 & 7 on the human right to adequate housing and on forced evictions. Following minimum international norms, eviction should be undertaken only as a last resort and in accordance with the following eight principles: (a) an opportunity for genuine consultation with those affected; (b) adequate and reasonable notice for all affected persons prior to the scheduled date of eviction; (c) information on the proposed evictions, and, where applicable, on the alternative purpose for which the land or housing is to be used, to be made available in reasonable time to all those affected; (d) especially where groups of people are involved, government officials or their representatives to be present during an eviction; (e) all persons carrying out the eviction to be properly identified; (f) evictions not to take place in particularly bad weather or at night unless the affected persons consent otherwise; (g) provision of legal remedies; and (h) provision, where possible, of legal aid to persons who are in need of it to seek redress from the courts. Furthermore, evictions should not result in individuals being rendered homeless or vulnerable to the violation of other human rights. Where those affected are unable to provide for themselves, the State party to ICESCR must take all appropriate measures, to the maximum of its available resources, to ensure that adequate alternative housing, resettlement or access to productive land, as the case may be, is available. Failure to adhere to these norms constitutes a “gross violation” of human rights, in particular adequate housing. Zimbabwe’s own 2013 Constitution grants citizens the right to freedom from arbitrary objection: “no person may be evicted from their home or have their home demolished, without an order of court made after considering all the relevant circumstances” (Section 74). The Zimbabwean Constitution also enshrines the national objective on shelter: “all institutions and agencies of government at every level must take reasonable legislative and other measures, within limits of the resources available to them, to enable every person to have access to adequate shelter” (Section 28). Zimbabwe’s Regional, Town and Country Planning Act also requires the authorities to issue an enforcement order giving all persons likely to be affected by demolition of property at least one month notice of the intended demolitions (Section 32). The African Commission on Human and Peoples’ Rights has furthermore issued a resolution on the right to adequate housing and protection from forced evictions that asked countries to put an end to all forms of forced evictions. Ensure the irreversibility of the land reform program. Within these principles, we join Zimbabwe People’s Land Rights Movement and Habitat International Coalition’s Housing and Land Rights Network in calling upon you, Mr. President, to be true to your words in emphasizing the irreversibility of the land reform and ensuring that government work on policy that promotes and protects the beneficiaries of the land reform and also put an end to the continued violations of section 74 of the Constitution of Zimbabwe. We look forward to hearing of your efforts, Mr. President, to ensure that state institutions adhere to the dictates of the Constitution and value human rights, in particular adequate housing, continuous improvement of living conditions and land rights of the poor and vulnerable. We also encourage your intervention to see to it that all state institutions seek accountability and liability of those (officials and others) engaged in corrupt land deals and that all relevant organs of the state ensure that the conditions for legal evictions (General Comment No. 7) are met before initiating any eviction process. This would begin with an impact assessment in advance of any evictions or resettlement, as well as currently displaced persons, in order to ensure reparations for those affected. We also urge that the Land Commission cooperate with the provinces to conduct and publish a thorough and transparent land audit in areas of land disputes, including areas where the state and its organs seek the removal of inhabitants under any pretext. In doing so, we recommend that all relevant organs of the state apply the UN Basic Guidelines and Principles for Development-based Evictions and Displacements. We thank you for your attention on this urgent matter and kindly request you to keep us informed about the actions taken by your good offices.